I’m sure everyone recalls the love fest’s I have had with Bennet’s Fresh Roast Donuts. They are homemade pieces of goodness. Last month, we decided to try another local homemade Donut Shop in Bonita. This shop is sure to Get You On Track as it’s name is Trackside Donuts & Cafe. 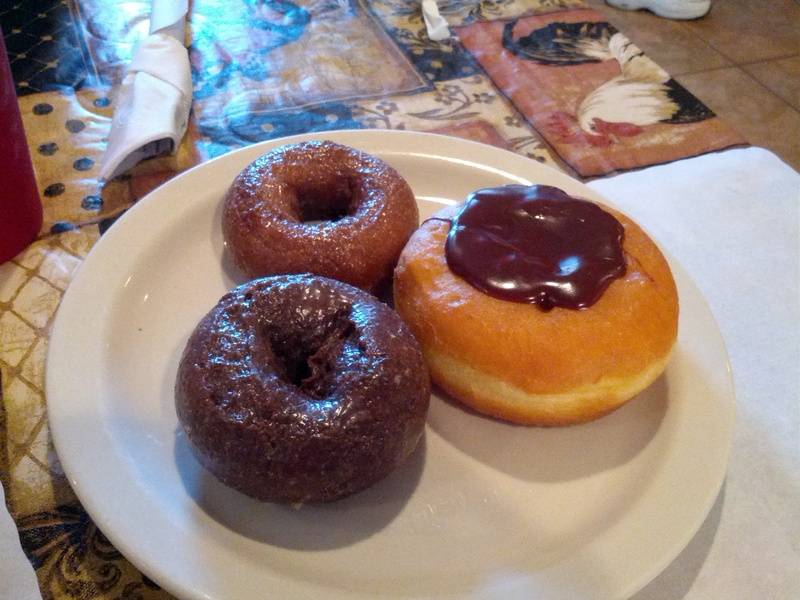 Located in Bonita, this is a homemade donut shop and cafe…just as the name implies. While they are indeed homemade, they are no where as good as Bennet’s. Like no where. We rode our bikes to Trackside and arrived around 7:30am. We decided to try a few different donuts, based on reviews online. We opted for an Apple Fritter, Chocolate Cake Donut, Pumpkin Donut and a Boston Creme Donut. 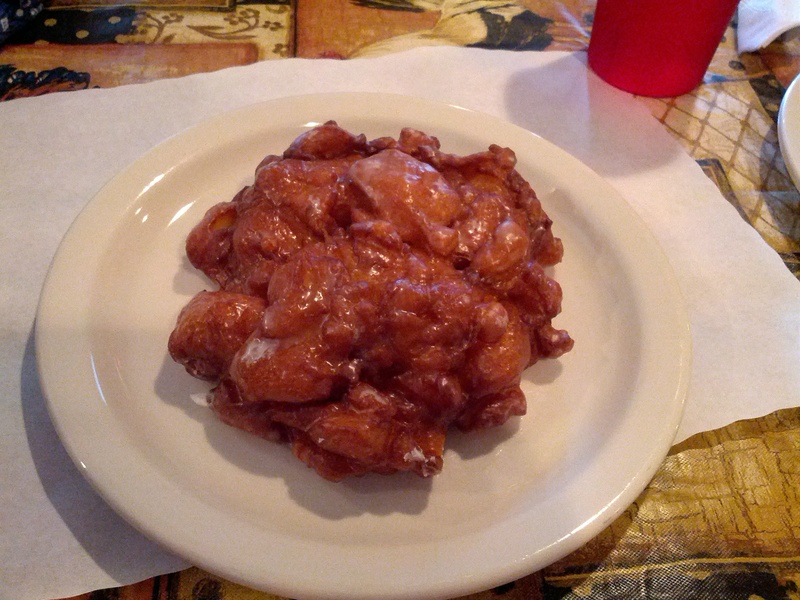 First off, the Apple Fritter was hard, fried to the state of being fair food and doused in sugar. I found the flavors to be so muted by the addition of so much sugar. Perhaps if this wasn’t fried up as much, it would have been better. But for me, and I love sugar, this was just too much. I was really looking forward to the Chocolate Cake Donut, as they are my favorite. Well, they are my favorite but not from Trackside. This donut was overcooked which caused it to be dry and lacking in the flavor department. Perhaps with a glass of milk this would have been tolerable but, as it was, it was certainly not. The Pumpkin Donut followed suit…overcooked & lacking in flavor. I found the Pumpkin to be a bit more tasty than the Chocolate but overall, no bueno. As for the Boston Creme, this one wasn’t too bad. The donut itself was cooked quite nicely and the creme inside was not overpowering. This is not my type of donut at all but, compared to the rest, it was edible. After we rode back home, I crashed with a massive stomach ache and ended up needing a nap before I felt fully recovered. My stomach just did not care for these donuts at all. I am guessing we are an exception to Trackside, as they stayed extremely busy the entire time we were there. I really wanted to like Trackside as all employees were quite nice. But, lack of tasty donuts is just not cool in my book. I love the concept of fresh donuts but, they have to be good. Simply put, I will not be returning. I’d rather stay off the Track than Get On Track with Trackside.